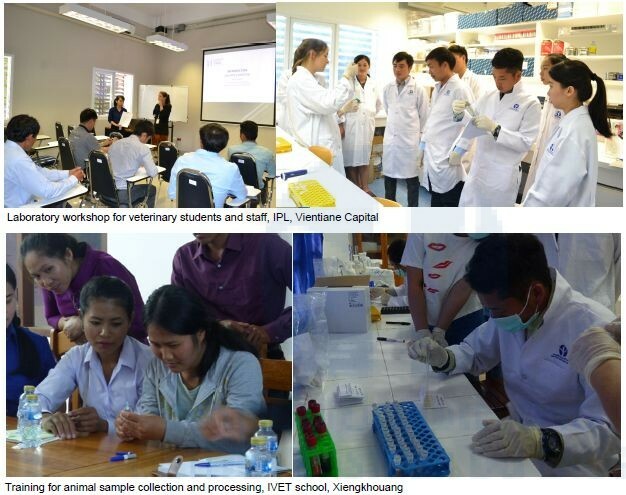 The WHO and Lao Ministry of Health announced the elimination of maternal neonatal tetanus (MNT) from Lao PDR in 2014. This was a result of a concerted effort to vaccinate women of child-bearing age and during pregnancy and to promote clean deliveries. WHO recommends 80% coverage of 2 or more tetanus vaccinations (TT2+) in pregnancy to maintain MNT control. In spite of this, tetanus vaccination coverage is variable nationwide. 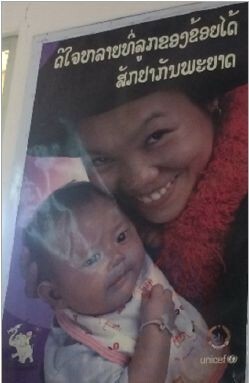 We aimed to look at the tetanus vaccination coverage and seroprotection in mothers and their newborns in healthcare facilities in Lao PDR. 185 pregnant women giving birth in three district hospitals in Savannakhet province, Lao PDR were recruited. A questionnaire was administered to determine factors associated with seroprotection and blood taken from mother and cord blood to be tested for anti-tetanus antibodies by ELISA. 77% of mothers and 79% of newborns had protective antibodies against tetanus. Only 70% of the mothers received one dose of TT vaccination during ANC consultation and even fewer – 45% – received the recommended two injections. Although most of the vaccination took place during ANC 1 and 2, many were missed at these time-points. Anti-tetanus IgG antibody in the mothers was associated with maternal age, number of ANC visits, number of TT vaccinations during and before pregnancy and gestational age. Women were unaware of the importance of vaccination and that vaccination during pregnancy can protect the fetus and newborn. Our data confirm the importance of maternal tetanus vaccination in providing protection for the mother and child, however we find very low awareness of vaccination in the mothers and identify missed opportunities to vaccinate women during early ANC, leaving a number of women and newborns susceptible to tetanus infection. Figure 6. 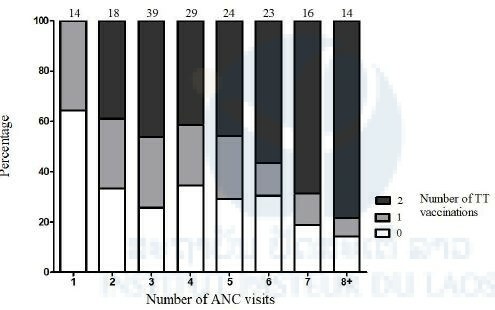 The importance of ANC and maternal vaccination during pregnancy A. Maternal antibody titre versus number of ANC visits. B. maternal antibody titre versus number of TT vaccinations during pregnancy. C. Cord blood antibody titre versus number of ANC visits. D. Cord blood antibody titre versus number of TT vaccinations during pregnancy. Lines represent mean and standard deviations. 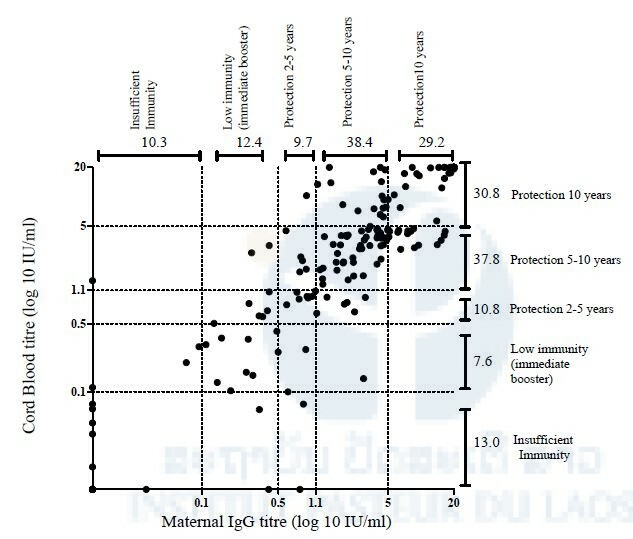 Numbers above each category represent the percentage protected (anti-TT greater than 0.5IU/ml). * p≤0.5, **p≤0.01, ***p≤0.0001. In order to increase the tetanus vaccination during ANC and therefore improve the seroprotection of mothers and newborns, we advocate vaccination at the first and second contact for ANC. This would increase the coverage of TT2+ and reduce the number of women and newborns susceptible to tetanus infection at birth and during early life. In the long run, the MOH may also consider WHO recommendations for a booster dose of tetanus (e.g. as pentavalent vaccine) between 4 to 7 years of age and an additional dose at school age, a policy which reduces the need for TT vaccination during ANC to one dose. These data are being formulated as a policy brief, for communication with MOH and other relevant policy makers and stake holders. A manuscript of these data has been submitted.